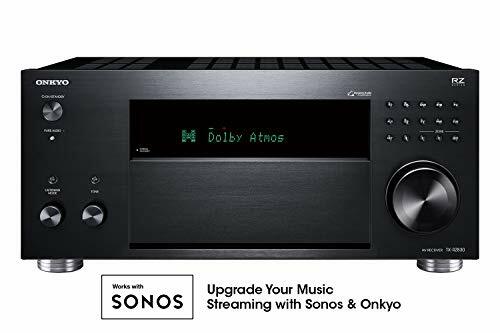 Your Onkyo receiver can now be part of your existing Sonos Home Sound System, or the start of a new one. 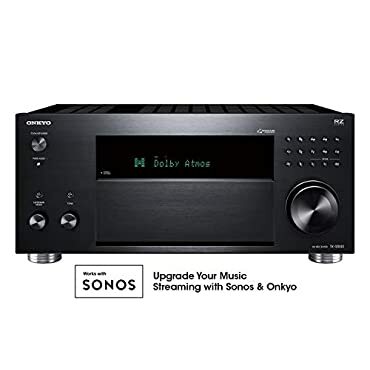 Instantly upgrade the music streaming capability of your home theater receiver with Sonos Connect and a free firmware update. Feed your speakers the sound they deserve with the TX-RZ830, Onkyo premier mid-class 9.2 Ch. A/V receiver, and unlock complete 7.2.4-Ch object-based audio coverage (outboard stereo amp required), universal 4K HDR pass-through, and custom dynamic audio amplification housed in a robust aluminum-fronted chassis. Sound is fluid, expressive, and dynamically faithful to the source, Details resolving with astonishing transparency, ideal for high-resolution music including direct DSD 11.2 MHz, LPS via phono pre-amp, SACD from Blu-ray player, or music streamed over airplay. Compatibility with popular wireless audio platforms allows the TX-RZ830 to fit in seamlessly with other compatible components for easy multi-room audio. Mobile apps synchronize the content you want in different spaces with chrome cast built-in, DTS Play-Fi technology, or flare connect. Tidal, music, Spotify, Deezer, and tune in are built in for easy navigation. Do your favorites a favor: order the TX-RZ830 and bring what you love to life. Onkyo TX-RZ830 9.2 Channel 4K Network A / V Receiver Black - BRAND NEW! -- Authorized Onkyo Dealer - Brand New - Full Warranty! Store: quatorz Condition: Brand New Price: $589.00 Total Price: $589.00 Buy It from quatorz No returns. Last updated: April 20, 2019 at 11:17 EST. Pricing information is provided by the listed merchants. GoSale.com is not responsible for the accuracy of pricing information, product information or the images provided. Product prices and availability is subject to change. Any price and availability information displayed on amazon.com or other merchants at the time of purchase will apply to the purchase of the product. As always, be sure to visit the merchant's site to review and verify product information, price, and shipping costs. GoSale.com is not responsible for the content and opinions contained in customer submitted reviews.